Return to the days of ancient Hawaii. Where stories and music passed down from kupuna (elders) are shared with you, our honored guests. The most significant style of celebration in ancient Hawaii was the luau, held to honor kings, gods and guests. The Grand Hyatt Kauai Luau welcomes you to join us for this time-honored event. The feast is sure to satisfy and the entertainment will keep you enchanted as you learn the traditional dance of the many locales of Polynesia. We invite you to experience the beauty, romance and adventure. It is an evening that you will always remember. Best lau that we have been to. Great dancers, excellent MC. Good music. No complaints. We had a wonderful time at the Grand Hyatt Luaui. Food was great, staff wonderful, and the show amazing!!! It was outstanding. From the history, to the traditional dances and song, my family and I enjoyed ourselves. The view and atmosphere at the Grand Hyatt was gorgeous. I'm so glad we chose the Grand Hyatt Luau. Great luau. The food, setting, service and show were wonderful! We loved it! 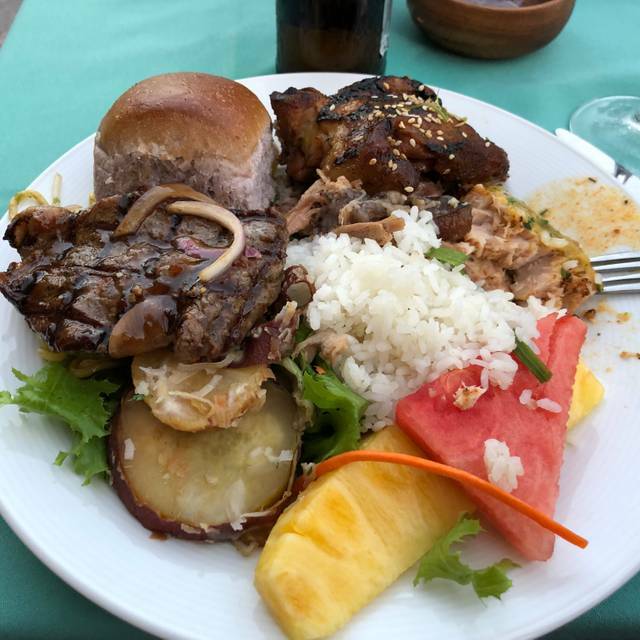 The food was much better than the other luaus I’ve been to on the island. Service was just ok since the waiter kept questioning why we wanted a second mai tai (mind you the guy next to us was on beer #4) and kept trying to clear our plates before we were even finished eating. The performance was really great. We were lucky to have the show on the front lawn overlooking the ocean. We had some breaching whales, as well, which really added to the experience. Overall, $125 seems a little steep for what we got but I’d still recommend to friends and family since, overall, this was the best all-around luau as far as quality of food, performance and location. My family spent the spring break at Hyatt Kauai, we attended the Lu’au event on Sunday’s night. We have attended one on Big Island last year, this time is much better. Food is very similar, but the shows are much better, the host is very funny and friendly. Everyone in my family did really enjoy it. Worst luau ever 😣 ! The food was quite good, but the entertainment looked like a high-school performance through a totally amateur sound system. We’ve been to Hawaii, including Kauai, many, many times. This was insulting it was so poorly done! Ridiculously overpriced. Pass on it!!! If you pay for all you can eat please do not remove the buffet so soon. I was only able to get one place of food. With visiting family, enjoying the show, taking pictures and visiting the vendors. There really isn’t much time to eat. The food was delicious but you remove the food to soon. I feel like I was not valued. 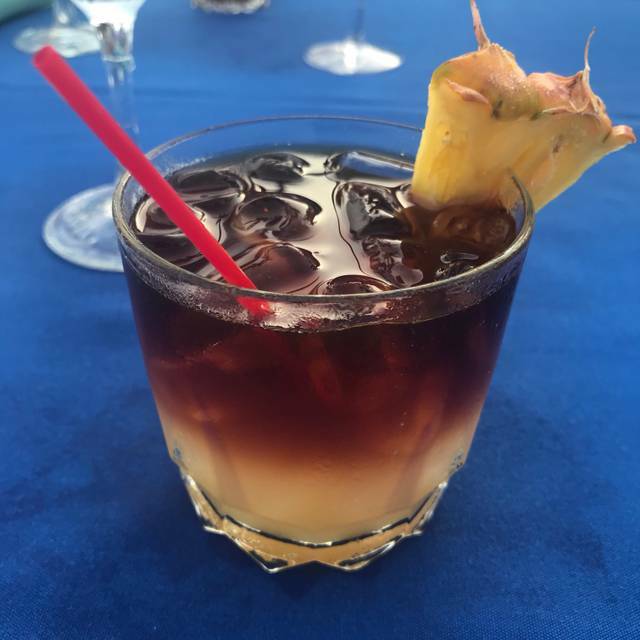 Our friends recommended the Hyatt over other Luaus based on the quality of the food and entertainment. The food was good with a variety of options and our server was very attentive and friendly. However the environment and entertainment was underwhelming. The luau was setup in a enclosed garden area off their conference area. I thought they’d setup on the beach. The dancers were well choreographed however the show just didn’t seem to create an engaging history of Hawaiian heritage. It felt flat. For Hyatt, I expected a much different experience. I heard about the Smith Family Luau seems like a much more engaging experience. Even though it’s off the beach the environment seems much more authentic. Great luau - kids loved it. Entertainment was terrific. This is my 4th luau and my family's 3rd. It was a great show. We really enjoyed the dancers & the story. What is unique about this luau (at least for me) is that they incorporated the fire dance and Somoan dances. The luau was outdoors (but I understand that there are times when it is held indoors). 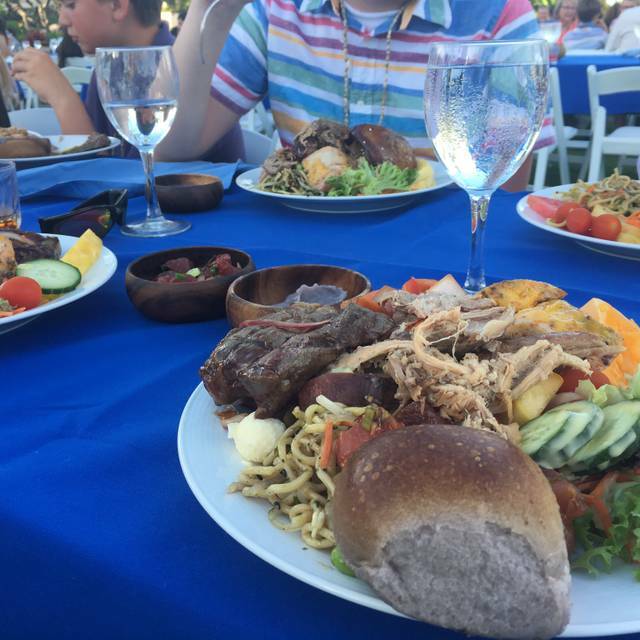 The food is pretty standard luau food. They do not have the ceremony where they dig the pig from out of the ground. There aren't many cultural activities or vendors but there is an open bar. So much fun. Best Lu on the island. Those that had to check in with reservations waited 30 to 45 minutes to get in. We missed the Hula lessons (if they had them). Didn’t have time to view the arts and crafts. We had to run to any seating that was still left. Bad start to our experience. However, the show and the food is good. Need to work on their check-in procedure. We were very excited to attend the luau, a staple to any Hawaiian vacation. Upon arrival, we were disappointed to find out the luau was being held in the grand ballroom, instead of the lush gardens and grounds. 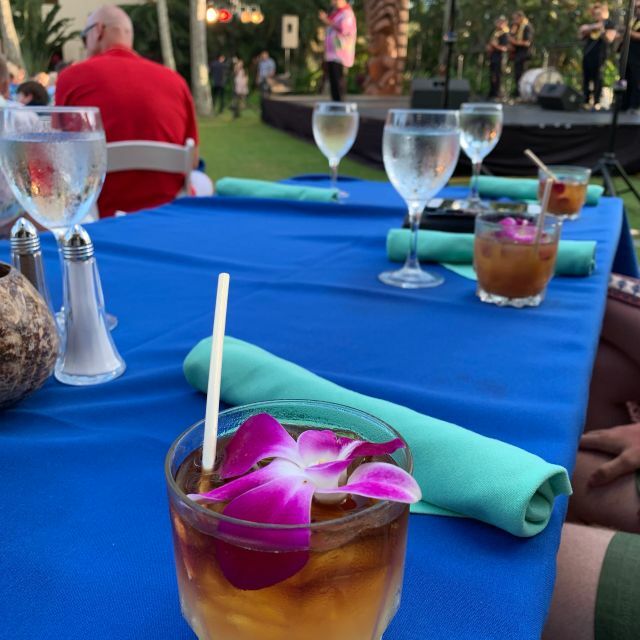 The entertainers were great, the open bar a delight (wish there were more mixed drink options that just mai tai) and the service was good. The food was a little lack luster, especially for the price and buffet style cuisine. Overall, fun time, but disappointing due to change in location. Wonderful, fresh food! Poke, Lomi Lomi, fish choices, chicken, beef, and let’s not forget the PIG!! All you can drink beer, wine, Mai Tais. Talented dancers, storytellers, and fire dancer grand finale! Worth every penny for my six year old’s entertainment and hubby’s 40th celebration. They should have been up front that the luau was going to be indoors. The ambience went to zero. Would have been better outside, but was moved inside due to the threat of rain. There was zero percent chance of forecasted rain, although a little windy. Love the buffet layout (the pork is amazing), deserts are okay. I have done this twice...they do a great job, just liked it better outside. The Grand Hyatt Luau helped to make our 29th wedding anniversary very special. It was a wonderful evening. This was our 4th luau and first on Kauai. Food was fantastic! 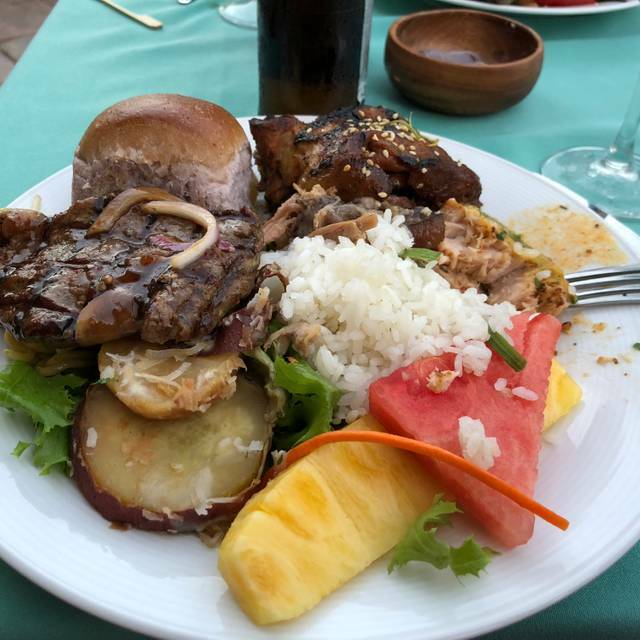 Excellent variety of all of the traditional foods you come to expect at a luau. We all tried a bit of everything and agreed everything was well prepared. The show was great as well. Great variety of dancing telling wonderful stories of the rich Hawaiian heritage complete with a fire dancer. Know when you book with open table you have to stand in a separate line and pay for and get tickets before entering. Even though we were there towards the beginning of the line when it opened we were some of the last to be admitted because we didn’t have our physical tickets in hand. It would be worth going to the hotel ahead of time and paying for your tickets so you can be admitted right away. Our biggest problem was the location. We were located in a courtyard up by the conference rooms. Absolutely no view of the beautiful ocean the resort sits on. We were expecting to be able to see the ocean and lovely sunset as we were at the luau. We were told the location was changed due to the rainy weather. Since it rained a great deal while we were there in December I suppose this is to be expected. Overall we had a great experience. Due to weather, event was indoors in the Grand Ballroom, outside experience would have improved ambience score. Unfortunately it was raining, so the luau had to be indoors; not as nice, but kudos to Hyatt for having it anyway! Food was great. I would have preferred a less "Hollywood-ized" version, but the kids loved it! Fun luau experience at the Hyatt. The food was very good. Entertaining dancing and dinner show along with some Hawaii history. The luau was outside on the lawn and made the experiment feel more authentic. All you can drink wine, beer and mai tai’s. Lasted about 2 hours. Price is a little steep, but overall was a good experience. We found the Grand Hyatt to be a beautiful location but the Luau was very overpriced for the food and service received. The show itself was good but I would not recommend this event and the price point of $125/pp. Event was cancelled and without any notice. Got to the event and was told event was cancelled due to weather conditions. The food and show was great but for what it cost is was very short. Over in 2 hours so I don't think worth the value of what we paid for it. Attended the Thanksgiving luau. The food and show were great, our server was very attentive, but we were disappointed that it was relocated inside (it was not raining) and there were so many people - three adjoining ballrooms worth of tables. It was not what we were expecting for our first luau. I read the prior reviews that said to reschedule if rain was in the forecast. 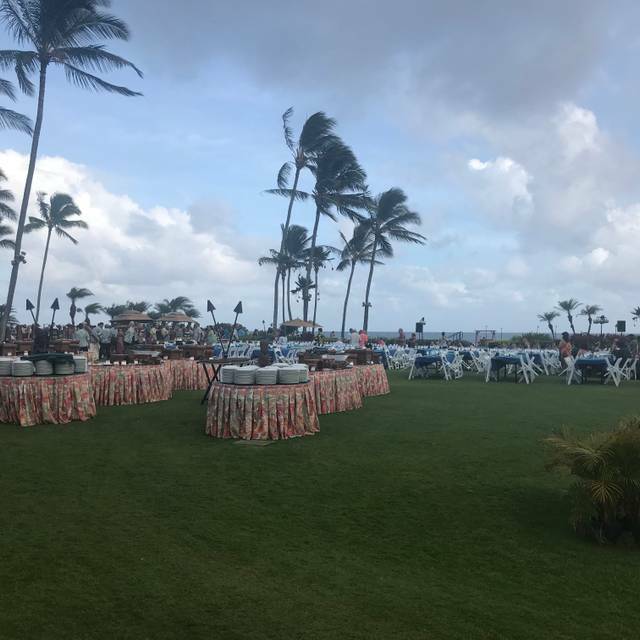 I confirmed that there would be no rain and they still held the luau in the ballroom. This took away from the Hawaiian experience. 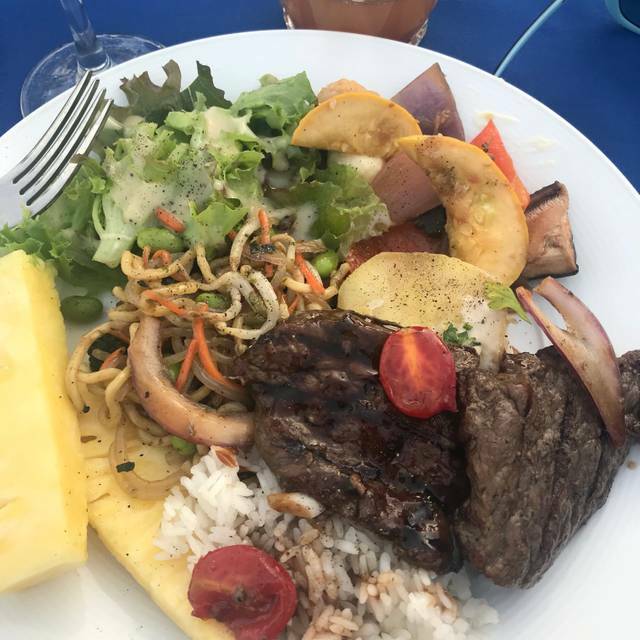 They definitely had the best food of all of Kauai luau's. They also offer a tremendous show. The ballroom takes away from the ambiance that is offered by the other luaus on the island which is so critical for the visitors experience. Wow, is all I can say. Just wow. I wouldn’t have thought it possible to completely wreck a luau, but the Hyatt pulled it off! It was like being at a Hawaiian-themed dinner in Kansas. Except we were actually on Kauai. And it cost > $800. This was, honestly, such a disastrous experience that it was almost enjoyable. Like, it was a once-in-a-lifetime debacle, entrusting our Thanksgiving dinner to the Hyatt. Pro-tip, guys: When people pay to go to a luau on Kauai, THEY PROBABLY EXPECT NOT TO BE INSIDE IN A HOTEL CONFERENCE CENTER. A luau normally has, you know, torches and stuff. Went to the thanksgiving luau. You must know if there is even a chance of rain they will move it inside. 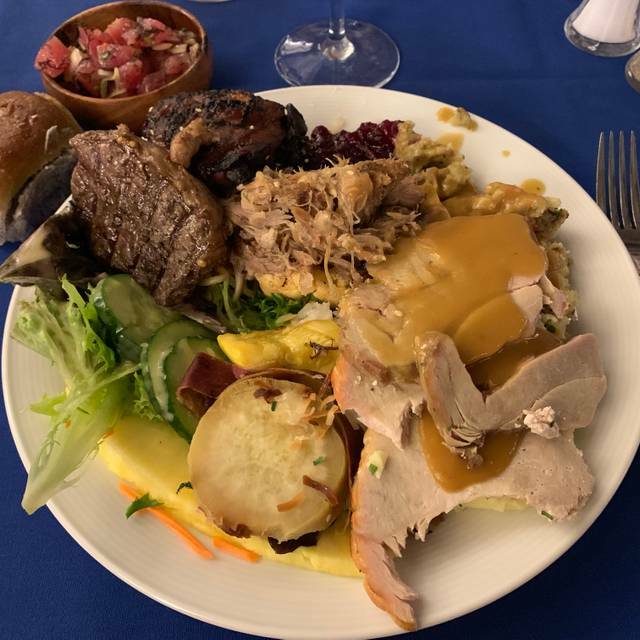 It was in a huge banquet hall with hundreds of people and for $125 a person and expectations of a beautiful outdoor luau on thanksgiving, this just wasn’t going to cut it. Felt like we were at a conference. We turned around and walked out immediately. Luckily we were able to get a refund and went to Donderos which was delicious. Our family of six enjoyed the thanksgiving luau but we’re sad that it was held indoors. We also thought there would be professional photos taken for purchase but not at this luau. I do not recommend this option for thanksgiving luau- over crowded, loud, food was cold. Very disappointing for the cost. Such a disappointment - be sure to check if it indoors or outdoors. If indoors, save your money.